It turns out that a year is not very long at all… and just like that, my time at St Francis Hospital has come to an end. But what a year it has been… and I decided it should go out with a bang. There aren’t many options for venues in Katete. There is a bar called the Executive Bar (not so executive really), a place to buy beer that has a pool table and a slightly seedy undertone called Mr. Warden’s, and finally, a bar with a pleasant outdoor area (and a pond) called Malo Gardens. Despite some construction work going on in the grounds, Malo Gardens was the best choice and were very accommodating. Jaffet, the manager, said we could have a private area outside, we could choose how many crates of beer and soft drink that we wanted to buy, bring our own snacks, and have a braai where people could buy food (T-bone or Chicken). 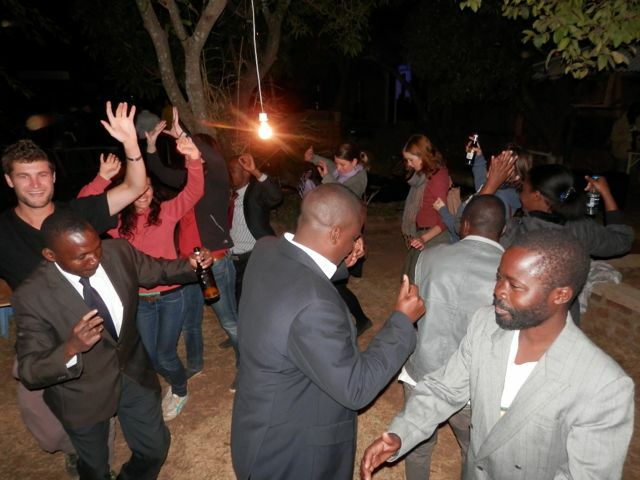 The private hire price was a steal at only 100 kwacha (about £12)… and with that our party was arranged. We made invitations, and started handing them out at work. There was a buzz in the air at the hospital and everyone I passed would say “Dr. Natalie, you are having a leaving party, where’s my ticket?”… No matter how many times we explained that they weren’t tickets, just invitations, and that you didn’t need one to get in on the night, people kept saying “can I take a few tickets for my friends?”… There was no point fighting it, we just printed more ‘tickets’! The party was due to start at 19:00, so we got there at 18:30 to set up (which involved putting crisps and roasted peanuts into chopped up water bottles - don’t forget the 3 R’s). We hadn’t hosted a Zambian party before, and weren’t too sure whether people would actually show up, or if it was just politeness when people said they would come… But at 18:59 the first guest arrived… I greeted him, took his drink request and opened his Mirinda Orange, and by the time I looked back up from the bar, the area was filled with smiling faces from St Francis Hospital – all clutching their ‘tickets’ of course. It seems that the ‘fashionably late’ concept hasn’t reached Zambia yet, and by 19:10 the party was in full swing and we didn’t have time to catch our breath from that point on! I felt very touched that so many people came. We danced to Zambian tunes until late, and I wondered why we hadn’t done a party for the whole hospital sooner. It felt wonderful getting everyone together outside the hospital walls, and everyone was smiling and merry and wearing their finest. It gave me a chance to meet the partners, sons, daughters and friends of my colleagues, as well as giving me the opportunity to say proper farewells to all the people that I worked with over the past year. I realized that although my time in Zambia was almost over, I was still learning a lot about the country. I observed that people fell into two classes: Mirinda Orange drinkers, or Mosi Beer drinkers… Coke, Sprite and Castle Beer were distant seconds in the drink choices. 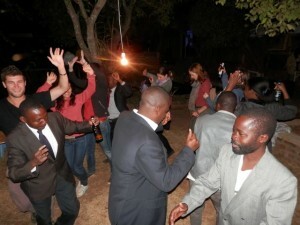 Secondly I observed that Zambians love to dance, with no age restrictions. Elderly nurses, young doctors and stern-faced office staff; everyone got involved in the Zambian beats filling the dancefloor… I smiled to myself when church songs (re-mixed as dance-floor fillers) would come on; we all had a good dance to the pumped-up version of “This little light of mine, I’m gonna let it shine”. I’ve become rather fond of Zambian dance music, but I have to accept that my rhythm and grooves pale in comparison to my Zambian friends and colleagues. Although the night was filled with smiles and laughter, I kept remembering with a heavy heart that the following morning I would be driving away from St Francis Hospital… but hopefully not forever. Sounds like it was a terrific party! It would have been especially fun to watch everyone dancing to “This Little Light of Mine” and other church songs. We sang those songs, too, but while sitting in the pews. Much better to dance to them. Leaving Zambia and St Francis Hospital is bittersweet, I’m sure. You will undoubtedly visit Zambia in the coming years and will forever have wonderful memories of your time there. I have thoroughly enjoyed reading your posts and have learned much from them about life in a region so different from where I live. As I mentioned before, I hope you’ll continue blogging. Best of luck and success to you and Will as you return home to new adventures. Although I only left a couple of comments at the start, I have followed your entire journey with interest and amazement. I can’t believe a year has already passed! Thank you for sharing your journey. It was wonderfully educational. I enjoyed your personal observations and photographs, which allowed me to peek into a world that is very different from my own. I wish you and Will all the best as you return home.